Thomas Rhett and wife Lauren Akins are expecting two children -- but they're not twins. 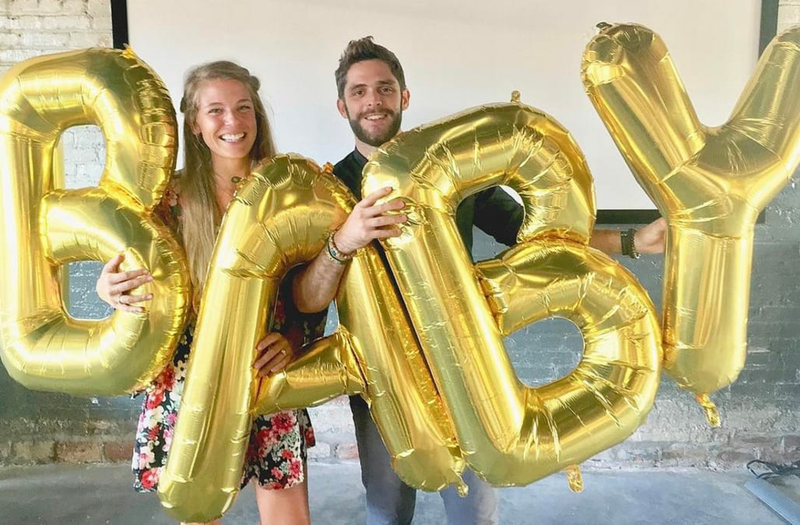 The 26-year-old singer posted a photo to Instagram on Wednesday morning of himself and his wife posing with balloons that spelled "baby" to announce that they are expanding their family. "We are so happy to announce that we are pregnant and we are in the process of adopting a child from Africa!" Rhett shared. "Safe to say life is about to get crazy!" Akins was also excited to share the news, posting to Instagram: "OH BABY! 😍 actually...BABIES! Our hearts are exploding with happiness for y'all to meet our new baby who we are bringing home from Africa soon, who is also going to have a little brother or sister because, SURPRISE! There's a sweet baby in my belly too." During a a Periscope chat with her fans on Twitter in September, Akins revealed that she and her husband were "gonna have kids, hopefully sooner than later." She also shared that she'd like to have five children. ET caught up with the parents-to-be at Sunday's GRAMMY Awards, and the "Die a Happy Man" musician couldn't help but gush over his wife. "I guess, when I got married, I started writing a bunch of love songs, and now here we are four years later and I'm still writing love songs about how happy we are," he exclaimed. "So I'm going to have to find some different content to write about." GRAMMYs 2017 Cheat Sheet: Everything You Need to Know Ahead of Music's Biggest Night! Jennifer Lopez, Celine Dion, Paris Jackson and More to Present at the GRAMMYs!